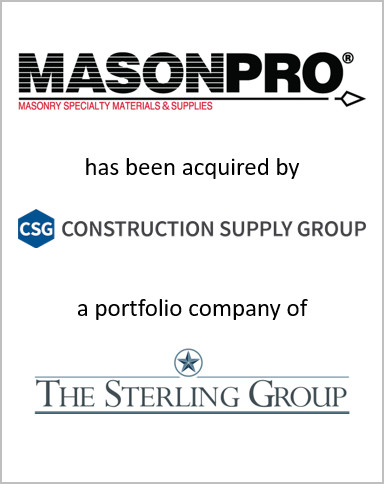 Greenwich Capital Group LLC (“GCG”) is pleased to announce its role as the exclusive financial advisor to MASONPRO, Inc. (“MASONPRO”) on its sale to Construction Supply Group (“CSG”), a portfolio company of The Sterling Group (“Sterling”). This transaction adds to GCG’s experience in the building products sector. Headquartered in Northville, MI, MASONPRO is a leading distributor of specialty masonry materials and supplies. Founded more than 30 years ago, MASONPRO has established itself as an industry innovator with a reputation for its high quality products and engineered solutions. The Company serves commercial, industrial, institutional and residential unit masonry markets across the U.S. and Canada. Construction Supply Group distributes construction materials, accessories and tools, primarily for professional concrete and masonry contractors. The company was formed by The Sterling Group in 2016 by bringing together Brock White, Border and Stetson. Over the last two years, CSG and Sterling have brought together thirteen businesses, forming the second largest specialty construction supply distributor in North America.